In 2009, the City of Toronto approved legislature to introduce a 5-cent levy on plastic shopping bags. 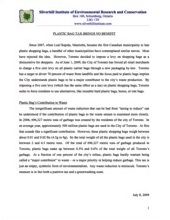 As of January 1, 2013, the City of Toronto banned �all� plastic shopping bags. The ban controversially includes bags that are �advertised as compostable, biodegradable, photodegradable or similar�. The Council's haste decision was made without proper stakeholder consultation and study of potential impacts. As a result, Silverhill Institute conducted research on this topic in order to provide more information to the Public. By Dr. Peter Homenuck, RPP, Professor Emeritus, Faculty of Environmental Studies at York University; and Travis MacBeth, MES. 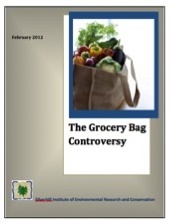 This report analyzes the new Toronto plastic bag tax. The report uncovers the flaws of the new tax and exposes how Toronto's city government puts emphasis on policies that appear "green" rather than ones that have real environmental benefit. This report also demonstrates the benefits of plastic shopping bags, discusses how the plastic bag market will continue to exist even with the ban, and includes suggestions for action that concerned citizens could undertake. By Dr. Peter Homenuck, RPP, Professor Emeritus, Faculty of Environmental Studies at York University; Ujunwa Nwachukwu, MES; and Celene A Mariano, MES. The Silverhill Institute of Environmental Research and Conservation conducted a study to provide some objective analysis of using renewable bags versus plastic one-use bags. This report is based on the analysis of journal articles and technical studies as well as 110 telephone interviews conducted in Toronto, Ontario in July 2011.